A covalent bond is formed between two non-metals that have similar electronegativities. Neither atom is "strong" enough to attract electrons from the other. For stabilization, they share their electrons from outer molecular orbit with others. An ionic bond is formed between a metal and a non-metal. Non-metals(-ve ion) are "stronger" than the metal(+ve ion) and can get electrons very easily from the metal. These two opposite ions attract each other and form the ionic bond. Covalent bonding is a form of chemical bonding between two non metallic atoms which is characterized by the sharing of pairs of electrons between atoms and other covalent bonds. Ionic bond, also known as electrovalent bond is a type of bond formed from the electrostatic attraction between oppositely charged ions in a chemical compound. These kinds of bonds occur mainly between a metallic and a non metallic atom. The covalent bond is formed when two atoms are able to share electrons whereas the ionic bond is formed when the "sharing" is so unequal that an electron from atom A is completely lost to atom B, resulting in a pair of ions. Each atom consists of protons, neutrons and electrons. At the centre of the atom, neutrons and protons stay together. But electrons revolve in orbit around the center. Each of these molecular orbits can have a certain number of electrons to form a stable atom. But apart from Inert gas, this configuration is not present with most of the atoms. So to stabilize the atom, each atom shares half of its electrons. Covalent bonding is a form of chemical bonding between two non metallic atoms which is characterized by the sharing of pairs of electrons between atoms and other covalent bonds. Ionic bond, also known as electrovalent bond, is a type of bond formed from the electrostatic attraction between oppositely charged ions in a chemical compound. This kind of bonds occurs mainly between a metallic and a non metallic atom. Covalent bonds are formed as a result of the sharing of one or more pairs of bonding electrons. The electro negativities (electron attracting ability) of the two bonded atoms are either equal or the difference is no greater than 1.7. As long as the electro-negativity difference is no greater than 1.7, the atoms can only share the bonding electrons. 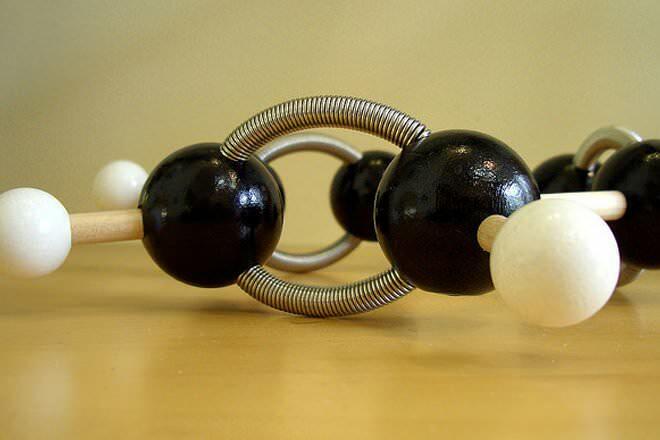 A model of the double and single covalent bonds of carbon within a benzene ring. For example, let us consider a Methane molecule i.e.CH4. Carbon has 6 electrons and its electronic configuration is 1s22s22p2, i.e. it has 4 electrons in its outer orbit. According to the Octate rule ( It states that atoms tend to gain, lose, or share electrons so that each atom has full outermost energy level which is typically 8 electrons. ), to be in a stable state, it needs 4 more electrons. So it forms covalent bond with Hydrogen (1s1), and by sharing electrons with hydrogen it forms Methane or CH4. If the electro-negativity difference is greater than 1.7 then the higher electronegative atom has an electron attracting ability which is large enough to force the transfer of electrons from the lesser electronegative atom. This causes the formation of ionic bonds. Sodium and chlorine bonding ionically to form sodium chloride. 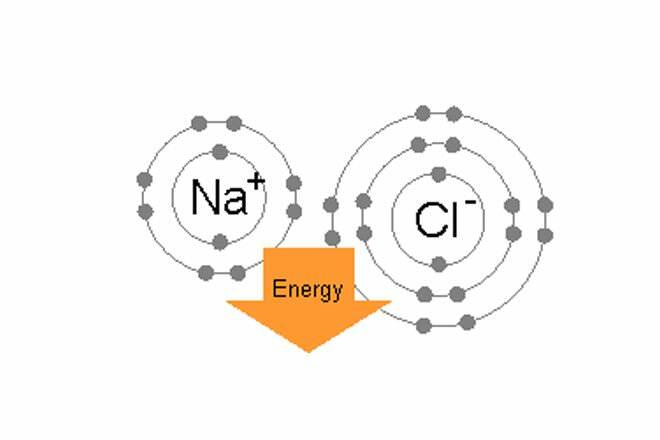 For example, in common table salt (NaCl) the individual atoms are sodium and chlorine. Chlorine has seven valence electrons in its outer orbit but to be in a stable condition, it needs eight electrons in outer orbit. On the other hand, Sodium has one valence electron and it also needs eight electrons. Since chlorine has a high electro-negativity, 3.16 compared to sodium’s 0.9, (so the difference between their electro-negativity is more than 1.7) chlorine can easily attract sodium's one valence electron. In this manner they form an Ionic bond, and share each other’s electrons and both will have 8 electrons in their outer shell. Covalent bonds have a definite and predictable shape and have low melting and boiling points. They can be easily broken into its primary structure as the atoms are close by to share the electrons. These are mostly gaseous and even a slight negative or positive charge at opposite ends of a covalent bond gives them molecular polarity. Ionic bonds normally form crystalline compounds and have higher melting points and boiling points compared to covalent compounds. These conduct electricity in molten or solution state and they are extremely polar bonds. Most of them are soluble in water but insoluble in non-polar solvents. They require much more energy than covalent bond to break the bond between them. The reason for the difference in the melting and boiling points for ionic and covalent bonds can be illustrated through an example of NaCl (ionic bond) and Cl2 (covalent bond). This example can be found at Cartage.org. I think this is a really good site. Helped me a lot. However, it should really expand on the differences and similarities between the two types of bonding. Overall, I understand these types of bonding so much more now. Also, it is really easy to remember thanks to the simple lay out. This is a great page! Thank you! GREAT INFO !! This really helped me on my Covalent and Ionic Bonding worksheet !